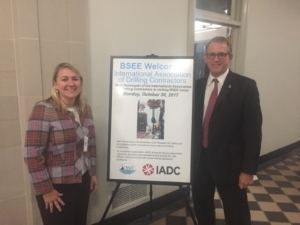 On 30 October, IADC was invited to meet with Bureau of Safety and Environmental Enforcement (BSEE) Director Scott Angelle to talk about the industry’s safety record, training and competence programs and IADC’s role in the industry. Mark Denkowski, IADC Executive Vice President, Operational Integrity and Liz Craddock, IADC Vice President, Policy and Government Affairs, attended the meeting. They also met staff members on the House and Senate Labor committees who are responsible for handling workplace safety and training. On 24 October, Department of Interior Secretary Ryan Zinke proposed a region-wide lease oil and gas lease sale on 76,967,935 acres in federal waters in the Gulf of Mexico, offshore Texas, Louisiana, Mississippi, Alabama and Florida. The sale is scheduled for March 2018 and includes all available unleased areas on the Gulf’s Outer Continental Shelf. The estimated amount of resources projected to be developed as a result of the proposed region-wide lease sale ranges from 0.21 to 1.12 billion barrels of oil and from 0.55 to 4.42 trillion cubic feet of gas. Most of the activity from the proposed lease sale is expected to occur in the Central Planning Area. All terms and condition for Gulf of Mexico Region-wide Sale 250 are detailed in the Proposed Notice of Sales (PNOS) information package available on the Bureau of Ocean Energy Management’s website. Aurelia Skipwith, Deputy Assistant Secretary for Fish and Wildlife and Parks, was recently granted a temporary Delegation of Authority to perform the assigned functions and duties of the Deputy Assistant Secretary – Lands and Minerals Management. The Secretarial Order highlighting this responsibility was issued on 17 October. It is expected that someone will soon be named to permanently occupy the post. The Secretarial Order can be accessed via the Department of Interior website. The U.S. House also passed the Budget Resolution for FY18, and passed the National Defense Authorization Act. The U.S. House is gearing up for tax reform legislation and is expected to release the tax bill on November 1st. The big action in the U.S. Senate this month was passing a Budget Resolution that will guide Congressional spending for the upcoming fiscal year. Contained in the Budget Resolution are budget reconciliation instructions for tax reform. These ‘instructions’ provide an avenue for the Senate to pass tax reform with only 51 votes vs. 60. Also, a win for the drilling industry was the defeat of an anti-ANWR amendment. It is expected that ANWR will be opened as a way to raise money/pay for the tax reform legislation. The Senate also continued to process nominations with confirming seven agency positions and two judicial appointments. The 2016 report, which includes data required to be reported by the Well Control Rule, covers the period when the rule went into effect on 28th July to 31st December, 2016. Members of the RAPID-S53 IOGP/IADC BOP Reliability JIP met with BTS a number of times in 2017 in Houston and Washington DC to review and advise them on the publication of their 2016 report. The report acknowledged the role of the JIP in working with BTS to standardize the data collection format and subsequent efforts to improve data quality. It also notes that the JIP is continuing to work with BTS to provide component population data to establish perspective of the component failures reported. The RAPID-S53 JIP plans to continue work with BTS to ensure the two data collection efforts are aligned and to assist them with the 2017 report. The 2016 report is available at the newly redesigned SafeOCS website at https://www.safeocs.gov/data_insights.htm. On 18 October, Energy Safety Canada was unveiled. Formed through a merger of Enform Canada and Oil Sands Safety Association, Energy Safety Canada is the national safety association for the oil and gas industry in Canada, bringing together the best of both associations to accelerate improvements in safe work performance. A new report from the U.S. Energy Information Administration (EIA) notes that U.S. energy-related carbon dioxide (CO2) emissions have decreased by 89 million metric tons, from 5,259 in 2015 to 5,170 in 2016. Although gross domestic product increased 1.5% over that period, other factors contributing to energy-related CO2 emissions more than offset the growth in GDP, leading to a 1.7% decline in energy-related CO2. The full report can be accessed via the EIA website. The U.S. Occupational Safety and Health Administration (OSHA) recently issued its Small Entity Compliance Guide for the Respirable Crystalline Silica Standard for General Industry and Maritime. The document is intended to help small businesses understand and comply with OSHA’s Respirable Crystalline Silica standard for General Industry and Maritime. The guide describes the steps that employers are required to take to protect employees in general industry and maritime from the hazards associated with exposure to respirable crystalline silica. Although the standard isn’t necessarily expected to directly impact the drilling sector, it is important to note that under subpart Z of the standard, under the heading of toxic and hazardous substances, mica and graphite are included, both of which are occasionally used in drilling fluids, and stored on location. To access the guide, please visit OSHA’s website. OSHA has also published a Fact Sheet, which can also be found on their website. 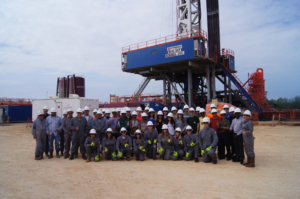 More than 40 petroleum engineering students from the University of Missouri-Rolla were treated to a rig visit in South Texas, hosted by Patterson-UTI Energy. The students, whose school now boasts an IADC Student Chapter, were in San Antonio for the 2017 SPE Annual Technical Conference and Exhibition. They visited Patterson Rig 247, which was working for Gulftex. 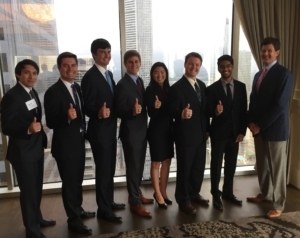 Seven Texas A&M petroleum engineering seniors, all members of the TAMU IADC Student Chapter attended the October meeting of the IADC Houston Chapter. These students earned scholarships from the IADC Houston Chapter. From left, Hector Menchaca, Scott Parnell, Jacob Braselton, Cameron Osterhaus, Jessica Wang, Shane Parish, Aalok Tripathi, and IADC Houston Chapter Chairman Chris Menefee, Independence Contract Drilling. For more information on the TAMU IADC Student Chapter, go to https://stuactonline.tamu.edu/app/organization/profile/public/id/1881. Oil and Gas UK recently published its Workforce Report 2017, which provides demographics data to complement the employment figures published in its Economic Report 2017. This document gives additional information on jobs supported by the UK upstream industry and the demographic breakdown of the offshore workforce. The full report can be accessed via Oil and Gas UK’s website. Create a new Christmas tradition for you and yours, and attend the Houston Chapter’s first Christmas Gala on Friday, 1 December, at the Petroleum Club of Houston. The Gala will feature a raffle benefitting Home Run Hitters International, supporting Dr. Deborah Carr’s Houston-based work with severely disabled children and their families. Due to reduced state funds and HISD finance restrictions for children with special needs, HRHI has lost school partners and support. Now more than ever, the organization and the children they serve need help. Due to the Chapter’s past generous contributions, the Houston Chapter has donated over $250,000. Norway’s Ministry of Labour and Social Affairs organized a group of representatives from employers, unions and government in November 2016 to assess and discuss the health, safety and working environment conditions and trends in the Norwegian petroleum industry. The resulting report, which was recently made available, provides recommendations for further follow-up and will serve as input for a new report on health, safety and the environment in petroleum activities. The orientation of the regulations, based on requirements that are generally performance-based in combination with the use of standards, is desirable given that the industry is developing rapidly and that the companies need to adopt the most appropriate technology at any given time. The main orientation of the regulations is robust and should be maintained. The full report (In Norwegian with an English summary) can be accessed here. PSA Norway’s response can be accessed via their website. The Dropped Objects Workgroup members recently released their recommended practice, Dropped Object Prevention Scheme Recommended Practice 2017. These documents represent ‘Best Practice’ as agreed upon by a consensus of the members of the DROPS workgroup. Certain processes and procedures detailed in the documents may require modification to suit specific locations, activities or facilities. However, the underlying guidelines are considered best practice and are a recommended component of any integrated dropped object prevention scheme. The guidelines are subject to review and update in response to improved methodologies and technologies. The Recommended Practices guidance is available for free download from the DROPS website and may be copied in part or full as required and employed in the prevention of dropped objects worldwide. 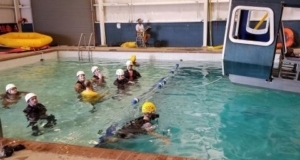 On 5 October, six petroleum engineering students and members of the University of Louisiana-Lafayette student chapter achieved their HUET certifications at the University’s Marine Survival Training Center. The U.S. National Academies of Sciences, Engineering and Medicine recently issued a new report that looks at designing safety regulations for high-hazard industries, such as pipeline transportation, chemical manufacturing and offshore oil and gas development. IADC’s Jens Hoffmark was a contributor to the report, along with Ida Maria Winther of Maersk Drilling. As the report was commissioned by the U.S. Departmet of Transportation’s Pipeline and Hazardous Materials Safety Administration, it is not yet clear that it will be considered by other agencies. The full report can be accessed via the National Academies website. Although Hurricane Harvey forced the IADC Houston Chapter to cancel their annual golf tournament, its sponsors came through to help the less fortunate. The vast majority of tourney sponsors stepped up, and contributed 50/50 to hurricane relief through the JJ Watt Fund and to the Chapter Scholarship Fund. The cancelled tournament was scheduled for 15 September, but the storm flooded the golf course. In addition, a total of twenty-four (24) other companies who purchased teams chose to contribute to the fund as well. On 29 September, 33 students with the IADC Student Chapter at the University of Louisiana-Lafayette (ULL) were treated to a facility tour of Knight Oil Tools in Lafayette, Louisiana. The company shut down their facility to enable the students who attended an opportunity to see and touch the equipment, which also included a demonstration of an accumulator unit. API will host the November RP54 meeting on Thursday, 30 November at the Francis Tuttle Technology Center in Oklahoma City, Oklahoma from 9 a.m. to 3 p.m.
For more information, please visit API’s committee website or contact Rhett Winter at Rhett.Winter@iadc.org. Please join the Subcommittee at the next meeting to participate in or learn more about the progress of the guidelines. The focus of the next subcommittee meeting is to review the guidelines for Minimum Cybersecurity Requirements for Drilling Assets. The next IADC ART Cybersecurity Subcommittee meeting will be at 9 am on 14 September 2017 at IADC headquarters in Houston. If you plan to attend, please register online at the IADC website. The theme is extreme at the 15 November IADC Drilling Engineers Committee, graciously hosted by Baker Hughes, a GE Company. Click here (http://www.iadc.org/event/iadc-dec-committee-tech-forum-4/) to register. The Q4 “Extreme Drilling” DEC Technology Forum includes presentations on ultra-ERD, high-temperature geothermal drilling, qualification of a 20,000-psi BOP, projectile-impact drilling, catastrophic blowout, and more. Lunch is included. Location is 3300 N Sam Houston Parkway E, Houston, TX 77032. There is no charge to register, but spaces are limited, so register soon. 09.00 JIP Proposal DEC-3: “Rho Ve Method – New Empirical Pore Pressure Transform” – Matt Czerniak, Director, GCS Solutions, Inc.
Abstract: Mr. Scherer will explain his company’s plans to harvest heat from the very hot brittle-ductile transition zone to create competitively priced utility scale power. GreenFire believes that the principal reason for the anomaly of the earth’s enormous geothermal energy (the greatest source of renewable, clean power in the world) remaining untapped is that solutions to the challenges of drilling into very hot rock, drilling accurately and then completing wells are not yet technically or commercially available. Mr. Scherer will describe the challenges the drilling industry must address to unlock the best source of utility scale power with large drilling campaigns deep into hot dry rock. He will also describe the attractive economics of these very large projects for all concerned. Abstract: An Operator in Indonesia had been drilling a conventional well to a vertical depth of 2160ft. Without prior warning the well kicked and began an uncontrolled flow to surface. The Operator managed to divert the flow, but not before hydrocarbons in the form of oil, gas and condensate escaped around the casing in a catastrophic blowout. The hydrocarbons ignited spontaneously, engulfing the rig and surrounding equipment in flames. As the well blew out it was accompanied by ejected formation debris, which led to a collapse of the surrounding area. As the well cratered it swallowed the entire rig, adjacent machinery and equipment and led to surface broaching in several nearby locations. The presentation will focus on the surface intervention operations of this remote location, the engineering and implementation of a technically challenging shallow relief well and the successful interception and subsequent control of this highly volatile blowout. Abstract: Exxon Neftegas Limited, the operator of the Sakhalin-1 Project, along with its partners, has been employing extended reach drilling practices consistently through its drilling campaign to develop resources in Far East Russia on Sakhalin Island. Originally implemented to allow access to offshore reservoirs from onshore drilling locations, technology advancements, design methodology evolution, and continuously improving drilling practices have allowed the operator to push the once perceived limits of extended reach drilling to access and develop resources from existing drilling and production infrastructure that would once have required new facilities or have been left unrecovered. Abstract: After discovering a field in the Deepwater GOM with a mudline MASP exceeding 15,000 psi, Anadarko Petroleum Corporation assembled a “20A” team consisting of experts in the design development, manufacture, and inspection of Drilling, Completions, Intervention, Subsea and Subsurface Equipment in a 20,000 psi environment. This presentation will explore the the evolution of the concepts that were encountered in the Drilling specific areas of the 20,000 psi BOP and MODU. It will also touch on the process involved in the design verification and testing validation for this equipment to meet the regulatory requirements. Abstract: Funded by Shell GameChangers and private equity, HyperSciences (General Hyper) is a hypersonic platform technology development company that significantly reduces the cost of conventional oil and Gas and Geothermal Drilling, mining, tunneling and construction excavation. The company’s patented and proprietary technology utilizes hypervelocity propulsion with low-cost erodible hypersonic projectiles to dramatically accelerate rock breaking in traditional underground applications. HyperSciences core product is Hyperdrill™, a patented steerable repetitive impact downhole tool that is a substantial enhancement to, yet compatible with existing drilling systems. This plug and play approach reduces the time, cost and adoption friction for existing operators and service providers using well established practices. Mature and proven with Shell sponsorship, HyperDrill™ offers 3-10X ROP (Rate of Penetration) drilling improvements over best in-class conventional rotary drilling in oil and gas (O&G) and is the key to enabling on-demand Geothermal “Anywhere” wells. Independent studies conclude that HyperDrill saves over 50% rig days and generate net savings of over $1.5M per well in traditional environments and $4-$7M per well in hard rock offshore environments, translating to over $2B annual commercial value. The IADC Well Control Conference of the Americas has been rescheduled for 6-7 December at the original location, Moody Gardens, in Galveston, Texas. The event, which was initially supposed to be held in August, was cancelled due to Hurricane Harvey. To register or view more information about the rescheduled conference, please visit the IADC Events website. New modules on IADC’s DrillingMatters.org provides details the myriad products both trivial and critical that are based on hydrocarbons, and showcasing the industry’s solid environmental record. In addition, DrillingMatters.org now features an improved interactive drilling rig, allowing users to point and click and learn more about key drilling components. Also, a new glossary provides definitions for a plethora of industry terms. “More than a Fuel” shows that from the food we eat, to the clothes on our backs, to cosmetics and skin care products, soaps and detergents, life-saving medical equipment and pharmaceuticals, building materials, toys and packaging materials, thousands of the products we use and depend on every day are made from hydrocarbons. Drilling Matters’ new Interactive Rig Tour uses narrated video clips to explain the basics of key rig systems. Finally, Drilling Matters’ new glossary describes equipment and will help educate industry newcomers about the meaning of numerous industry terms. Graphics, narrations and videos are planned for the glossary. Drilling Matters is a web-based, modular and interactive website designed to dispel myths and correct misconceptions about the petroleum industry. DrillingMatters.org now comprises modules discussing drilling equipment, drilling people and companies, the value of hydrocarbons, energy poverty, and more. Drilling Matters: Spread the Word. Interface between an item and its surroundings. Weatherford Drilling Int’l: Rig 155 (5); Rig 157 (1); Rig 180 (1); Rig 867 (1).